I’m a ukulele teacher. I’m not a singing teacher. But singing is central to the way I teach and play ukulele. For me, the whole purpose of playing the ukulele is to sing songs. Singing is one of the great routes to joy. And singing songs that you love makes it even better. I’ve always loved singing. But for many years I was too scared to open my mouth and sing. I started singing again, thanks to the ukulele. Read on for my tips on how to play ukulele and sing at the same time. But first I’m going to talk about singing more generally. Singing is one of life’s pleasures. Freeing your breath and making a joyful sound is a great route to creative expression. Linguists theorise that humans started singing before we had language. Singing is empowering. It’s about expressing who you are. It’s about shifting emotions. Singing is also a great tune-up for your lungs and for the rest of your body. The vibrations and breathwork shift the body’s energy. Singing is healing in a big-picture, holistic way, and sometimes more specifically than that. Many people experience a strong spiritual connection when singing. Too many people don’t sing. I used to be one of those. I don’t have the greatest voice in the world, but I wanted to sing. But for long stretches of my life there was no opportunity to sing. Most classically trained instrumental musicians are not encouraged to sing. Singing becomes a specialised thing. Even in pop music and rock bands, many highly skilled musicians don’t open their mouths. I had some bad experiences (involving microphones, high volumes and nervousness) and gave up singing with bands. When I auditioned for choirs my voice would always block up through fear and I’d get turned down. Even when I joined a wonderful World Voices singing group that didn’t have auditions, and sang every week, my voice stayed blocked and small and lacked resonance. I could sing in tune and I could learn parts easily. But other people in the group would drown me out. A lot of people are scared of singing. Including me, for many years. There’s so much judgement and shame. Some of it comes from inside and some from outside. Some people are literally told to keep their mouth shut. It’s been a long journey for me to get used to singing in front of a group of people. And the ukulele has been an important part of this. While I’m playing ukulele, there are so many other things to think about that my inner critic gets distracted. In my experience the ukulele works better than the guitar for learning to sing. I love guitars. But a guitar is harder to play than a ukulele. It’s louder, so it’s more likely to drown one person’s voice out. And, with a guitar there’s more external expectation that you will be at a particular level of skill. Whereas the ukulele is so small and easy and not-serious that it slips under the ego radar for me, and for a lot of people. We can lose our self-consciousness. Vocal skill is a matter of practice. If you don’t sing regularly, your voice will probably get rusty with disuse. It will get better when you sing regularly. Here are some practice tips, based on my own experience. First you have to first get used to the sound of your voice. There’s no way round this. Sing on your own, at home. I’ve been doing fifteen minutes of singing practice every day for the last year and my voice is gradually freeing up. Make singing part of your regular life. Weekly at least. Group singing is wonderful fun. Also, belonging to groups gives regular opportunity and accountability for singing. Whether it’s a choir or informal singing group, a ukulele group or sing-alongs with family or friends. Singing in tune is a matter of practice. You can get better with awareness and practice, over time. If you’re not sure whether you’re in tune, practice singing single notes with a tuner or tuner app. I know of people who used to be tone deaf, who taught themselves to sing in tune using a digital tuner. When you’re learning to play a song on a ukulele, you’re multi-tasking. There are so many things to think about – the chords, the strum, how to fit these together, the words, and much more. Don’t try to do everything at once. Build up gradually. See my post about how to practice a song for more on this. Learn the chords and the strum first. Then start singing the words. Begin by singing the easiest part of the song. This is often the chorus. Don’t always start at the beginning. Sometimes the beginning of a song has something tricky about it and this discourages you from persevering. When you learn the beginning of the song, it’s helpful if there is a “count in” instruction. That tells you where to start singing (relative to the chords and the strum). Be kind to yourself. Even highly experienced musicians don’t expect to be able to play and sing a song perfectly the first time. Or the second time. It usually takes at least 20 repeats, over a couple of weeks. Some strums are much harder to play while you’re also singing. Especially the more complicated strums. Most Youtube videos don’t mention this important point! My philosophy with strumming is to choose the simplest strum that sounds right for the song. 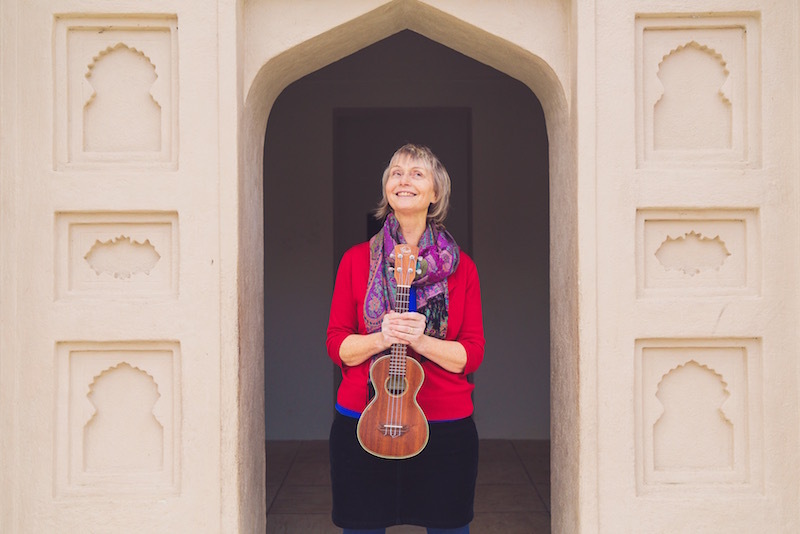 I teach ukulele to people all over the world via Zoom and Skype. 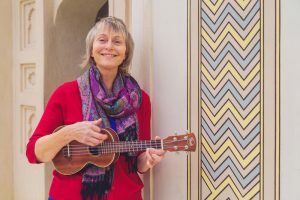 If you happen to live in Hamilton, New Zealand, you can find out about my group ukulele classes here.